Phytecs > Jürg Gertsch, Ph.D., M.Sc. 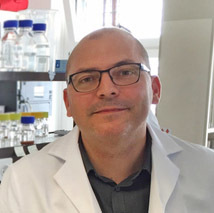 Since 2014, Dr. Jürg Gertsch has been the Co-director of the Institute of Biochemistry and Molecular Medicine at the University of Bern, Switzerland, where he serves as full professor of Membrane Biochemistry. Dr. Gertsch has done fieldwork among the Yanomami Amerindians in Venezuela and carried out research expeditions in Mexico, Bolivia and Sarawak. Dr. Gertsch studied cultural anthropology at the Universidad Central de Venezuela (UCV) and Neurosciences and Biochemistry at Sussex University and the Biozentrum Basel. He received his M.Sc. in Biochemistry from Sussex University and his Dr.sc.nat. in pharmacognosy, ethnobotany and natural product chemistry from the Swiss Federal Institute of Technology (ETH). Between 2004 and 2009 he was a group leader at the Institute of Pharmaceutical Sciences at the ETH Zurich. He has taught pharmaceutical biology and ethnopharmacology at ETH and the University of Zurich. He was a visiting professor at the University of Cagliari and has lectured at the University of Guadalajara in Mexico. His current research focuses on molecular pharmacology of the endocannabinoid system and drug discovery. His research group in Bern works on projects related to chemical biology and biochemical pharmacology of lipids, both as basic research and in collaboration with industry. He is a PI of the NCCR TransCure and the EU FP7 program MedPlant. Dr. Gertsch is author of more than 90 scholarly articles in renowned international journals and has received major European awards in the area of natural product research (A Vogel, 2003, Willmar Schwabe, 2010, Kneipp, 2014).